After a massive response last year with 130 entries from top 25 design colleges across India, Max Design Awards is back with a promising platform and truly rewarding gratification options. This design platform created by Max gives students a chance to showcase their best and reach out to the world through their creations. Max, being a highly design driven brand, with a team of 32 designers working for Max India nd over 1000 globally, is looking to suppot and celebrate new and upcoming fashin talents. Over the last 2 years, Max has been facilitating emerging talent of India through their initiatives like Elite Model Look, Max Fashion Icon and so on. Continuing in the same spirit, Max Design Awrads 15-16, Student Edition is yet another effort to reward the young aspiring fashion designers and prvide them a platform to springboard their fashion design careers! The esteemed jury for Max Design Awards 2016 includes fashion designers Moisha Jaising, Rahul Mishra, Troy Costa and Nikhil Thampi, Executive Director Max Mr. Vasanth Kumar and project head Marc Robinson. The Gratification for Max Design Awards 2015-16 for top 3 contestants is - 3 months' internship with renowed designers such as Monisha Jaising, Rahul Mishra, Troy Costa and Nikhil Thampi. Cash prize of Rs. 50,000/- each. Photo shoot and feature in the leading fashion magazine ELLE India along with their collection. The Winner (out of the top 3 contestants) gets to work with Max, the leading international fashion brand in India. Registrations for the award programme is open now. 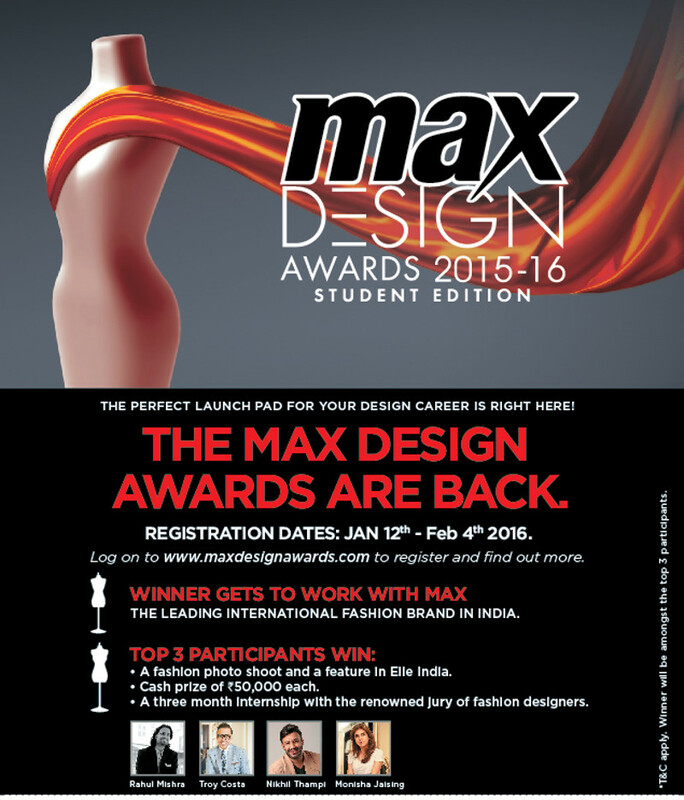 Log onto www.maxdesignawards.com to participate. Final year fashion designing students from reputed fashion design institutes. Out theme for the Max Design Awards 2016 is "Heritage Revisited". The theme is all about drawing inspiration from heritage and folklore and giving it a moder/unique spin. Step 1: Seect any one category - Menswear or Womenswear. Prepare a mood board of your interpretation of the main theme. Both sketches need to fall under any one category (menswear or womenswear) selected by you. Outline your color pallet, fabrics, style, patterns, etc. for each of the designs. Wish you all great luck with entries!